If you watch cars like we do, the first thing you may notice about the new 2019 Ford Edge is the price increase from last model year. The base Edge SE starts at $30,990, about $680 more the same SUV last year. But before you start complaining, we're here to tell you that the Edge has more value than ever, even with the price hike. Plenty of updates for the 2019 model-such as refreshed styling, new eight-speed automatic transmission, new standard features, and the new Edge ST trim-make this Ford Edge the best yet and well worth the money. In this preview guide, we'll run down what's new and what's still golden from previous years. Exterior changes are subtle, which is pretty typical for mid-cycle refreshes like this one. We're given a wider grille, a reshaped hood design, and new standard LED headlights. The Edge still looks bold and blocky, to its credit. If anything, the front looks even more snub-nosed. One fun feature is the center console in the cabin that now sports a rotary-style shifter, the same one we see in the Fusion sedan. That all-new shifter controls the eight-speed automatic transmission, a marked improvement six-speed automatic from last year. With more speeds, the transmission is more agile and conserves gasoline, improving fuel economy. The 2019 Edge also gives you a slew of new active safety features for the 2019 model. Those features fall under the Co-Pilot360 system umbrella, which includes automatic high beams, lane-keep assist, pre-collision assist with automatic emergency braking, blind-spot warning with cross-traffic alert, and a rearview camera. Higher trim levels are available with evasive steering assist, adaptive cruise control with stop and go, and a lane centering system. That's another huge step in value for this intrepid midsize SUV. Finally, the ST trim replaces the now-defunct Edge Sport. That's not just a name change. The Edge ST improves upon its predecessor. The biggest change is how the Sport's 3.5-liter engine has been replaced by the 315-horsepower twin-turbocharged 2.7-liter EcoBoost V6 engine, dishing out 380 pound-feet of torque. The old Sport went zero to 60 in 5.8 seconds. The ST trim should be able to beat that record. All-wheel drive is standard and the ST features newly-tuned and sporty suspension. What's Been Good All Along? The Ford Edge has made a name for itself with its quiet and spacious cabin, more than enough for both passengers and storage space. (39.2 cubic feet, accessible with hands-free liftgate!) We also like Ford's SYNC3 infotainment system, one of the easiest to use and quickest to respond systems among the big auto manufacturers. 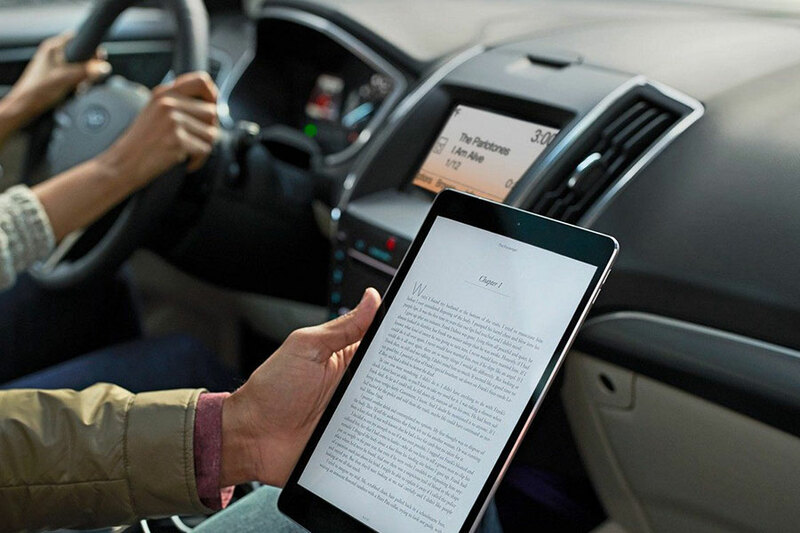 SYNC3 comes on an 8-inch screen and hosts Apple CarPlay and Android Auto to connect your smartphone to the Edge. Finally, we'd be remiss not to mention the fuel economy. The Edge gets a stalwart 22 city miles and 29 highway miles per gallon. With all these benefits, what's keeping you from stepping into the new 2019 Ford Edge?